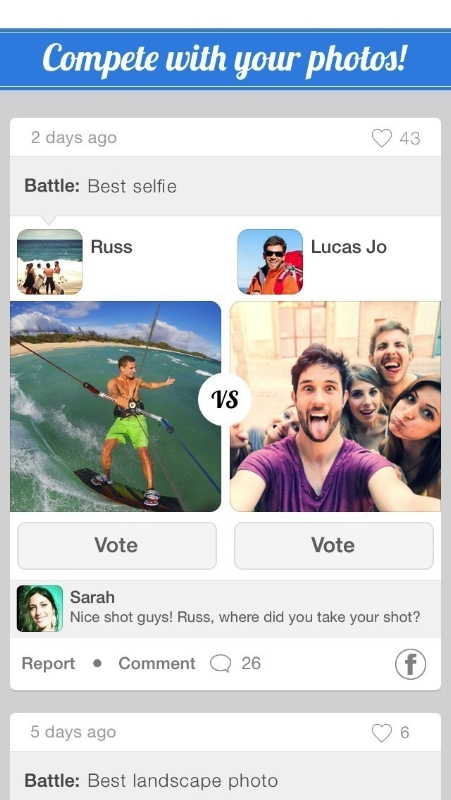 SocialBattles iPhone App Launches; Built For People Who Think Instagram Isn't Competitive Enough -- SocialBattles allows users to transform their everyday photos into fun and exciting competitions with friends, family and other SocialBattlers. Beta users label it "competitive Instagram" and "Instagram on steroids". New York-based SocialBattles Inc. has announced the worldwide launch of its free iPhone app "SocialBattles", available now in the App Store. Founded by two brothers who love to compete, the app allows users to create photo "battles" and challenge friends or other SocialBattlers using any battle title or topic they can imagine. There are two ways to battle: either by directly challenging someone to a 1-on-1 battle or by simply uploading a photo with a battle title to an open feed through which anyone can join. Once the battle is created, all SocialBattles users can view it and vote for their favorite. Rankings are updated in real time and are based on battle results. Current users are battling with photos of selfies, pets, vacations, fun activities, high-end photography, fashion, funny memes and pop culture, but users can photo battle with any battle title they can imagine. "We created World Hashtag Rankings™, which provides a world ranking of photo creators for each hashtag based on battle results. This gives photo creators an opportunity to build a reputation in any hashtag they care about," said co-founder Sandro De Moraes. SocialBattles is a Startup Weekend winner and has been in closed Beta in a few test markets and is seeing great user engagement and growth. "We are excited that key metrics are showing strong user engagement. One user battled 900 times in three months and another voted over 300 times on her first app open!," said De Moraes. The feedback from the Beta users has been overwhelmingly positive. As one super-user explained, the app is "a natural next step for sharing and engaging for the Instagram and Snapchat generation". Other users have described SocialBattles as "Instagram leveled-up" and "Instagram on steroids". "What I love most about SocialBattles is that it gives us a new way to interact and connect with people from around the world. The battling aspect of the platform creates a rich and unique lens through which to share and participate in the world's moments," said Alberto Escarlate, an advisor to SocialBattles and venture partner at Collaborative Fund. Battling is fun but not required to enjoy SocialBattles. Users can simply vote on battles, check out battle results and discover great photos and photo creators through the World Hashtag Rankings™. 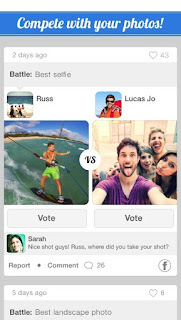 SocialBattles allows users to transform their everyday photos into fun and exciting competitions with friends, family and other SocialBattlers. "Ultimately, our goal is to give the world a new way to share their stories, be creative and interact through photos," said De Moraes. Founded by two brothers who love to compete, SocialBattles is a fun, free iPhone app that allows users to create photo battles and challenge friends. It gives users a platform to compete with their photos and get globally ranked based on "battle" results. Users have labeled it "Instagram leveled-up" and "Instagram on steroids". Battling is fun but not required to enjoy SocialBattles because users can simply vote on battles, check out battle results and discover great photos and photo creators through the World Hashtag Rankings™. The app gives people a new way to share their stories, be creative and interact through photos. SocialBattles is available now in the App Store. 0 comments on "SocialBattles iPhone App allows users to transform their everyday photos into fun and exciting competitions with friends, family and other SocialBattlers"